Factual error: In the scene where Billy's brother argues with a miner in the local shop, there is a plastic Polo dispenser that wasn't around in 1984. Continuity mistake: When Billy Elliot is looking for Mrs Wilkinson's house he is wearing his school bag over his shoulder. When, later, he gets out of the car he no longer has it with him. Continuity mistake: When Jackie is inside the bus leading to the mine, an egg hits his window, but when the bus is viewed from outside, the window is clean. 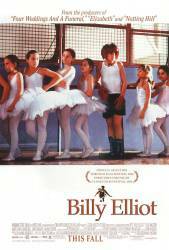 Continuity mistake: When Billy punches the other boy in the Ballet School after his audition, he hits the boy's face on the left side, but the boy grips his right side after falling down. Billy: I don't want a childhood. I want to be a ballet dancer. At one stage in the movie, Billy and his dance teacher travel across the Transporter Bridge, the only working cradle bridge in the world, which crosses the River Tees from Middlesbrough to Port Clarence, Stockton-on-Tees. At the time of the Miners Strike in 1984, when the film is set, neither Middlesbrough nor Stockton-on-Tees had an active coal field. Whilst the Transporter Bridge, now a grade 2 listed structure, is still working, it is not really a reguarly used entry or exit use from Teeside, if Billy and his teacher were going to an audition. Which raises the question as to why they were on the bridge, apart from giving the director the chance to show off a spectacular structure.